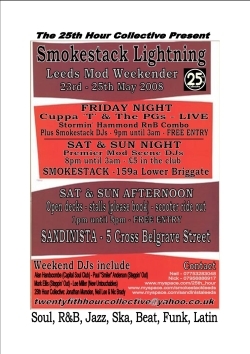 2007 saw plenty of great mod clubs and events, but possibly the best UK one was the Leeds weekender organised but the 25th Hour Collective. So its no surprise that many are already looking forward to the 2008 version. The May event, this year dubbed ‘Smokestack Lightning‘, has much to offer over its three days and two venues: live music on the opening night, a top selection of DJs joining the 25th Hour crew to spin all manner of vintage black music sounds, a scooter run, and the already infamous ‘North v South’ 5-a-side football clash. Will the north get their revenge for last years defeat? You’ll only know if you show up! 1pm until 5pm. Free Entry. Open decks, stalls, scooter ride out. 8pm until 3am. £5 on the door.